Conor McGregor dropped the ceremonial puck at the Bruins–Blue Jackets matchup at TD Garden. 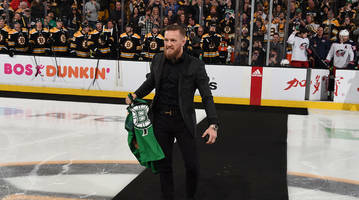 The UFC fighter dropped the puck at Saturday night's Bruins game. 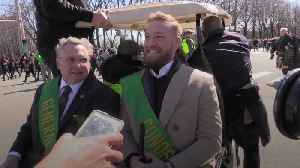 MMA star Conor McGregor and Taoiseach Leo Varadkar take part in Chicago's St Patrick's Day celebrations. 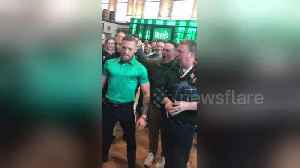 Conor McGregor showed off some enthusiastic moves for St Patrick&apos;s Day yesterday (March 15), as he was entertained by a bagpiper from the Chicago PD. 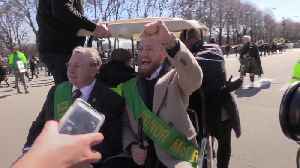 MMA star Conor McGregor and Irish premier Leo Varadkar have led the St Patrick's Day parade in Chicago. McGregor was arrested and charged with robbery in Miami earlier this week after allegedly.. 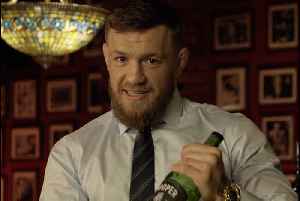 This video, "<a target=_blank rel="nofollow noopener" href="http://www.thrillist.com/videos/entertainment/nation/ufcs-conor-mcgregors-guide-to-celebrating-st-patricks-day">UFC's Conor McGregor's..